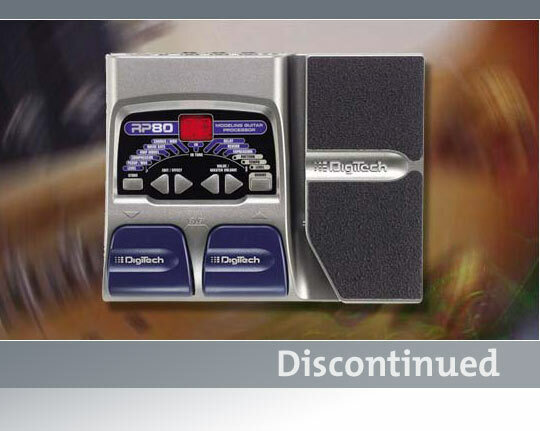 Setting a new precedent in features and affordability, DigiTech proudly introduces the new RP80 amp modeling guitar effects processor. The RP80 combines the tones of 11 vintage and modern Amps with a palette of programmable studio quality effects (up to 9 at once) with a built in expression pedal for unparalleled real-time control of your sound. Using a multi-effects device has never been easier thanks to the RP80's no-nonsense user interface. Just select the effect and dial in one of the great pre-programmed settings. If this weren't enough, the built-in Drum Machine is a great tool for practicing with and an easy-to-use 13-LED array tuner ensures your always in tune. The RP80 comes ready to use with 40 great Factory Presets, and includes 40 User Presets for custom creations. The rear panel features a single 1/4" input, 1/4" left and right outputs, and a 1/8" stereo headphone output for late night rehearsal. What is the reset and pedal calibration for the RP80? Make sure the power is turned off. Press and hold the left "EDIT" button while connecting the power. When the display reads "--", release the button and press the "STORE" button. The display should read "rE" and will be reset to the factory presets. When the display reads UP, put the expression pedal toe up, then press and release one of the up or down footswitches. The display should read dn. Put the toe down on the expression pedal, then press/release one of the up or down footswitches. This completes the process.